Derwin Gomez and Terrance Secore enjoy a magic show by Amazing Andy at the Opus for Person-to-Person Campership Picnic in July in Darien. Opus for Person-to-Person hosted more than 30 campers at its annual picnic on the front lawn of St. Luke's Parish in Darien. Sponsored by the Darien Sport Shop, the event featured lawn games, arts and crafts, and a magic show with Amazing Andy. Lunch and ice cream were provided for the campers by the Cow-abunga Food Truck. Guests were school-aged children who receive scholarships from Opus and Person-to-Person to attend summer camp. For the volunteers, it was an opportunity to meet those who benefit from the program. 600 children from low-income families to summer camp each year. This not only helps campers build life skills, but it also gives working parents a safe and dynamic environment for their children." 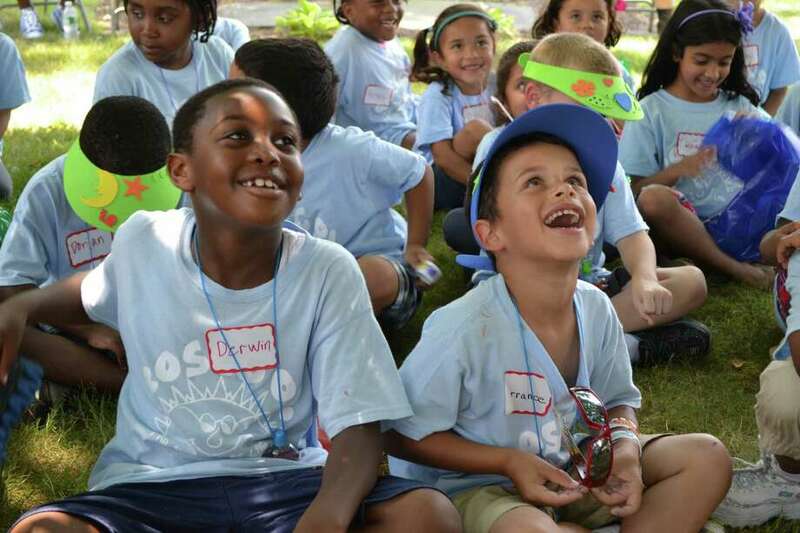 All children considered for camp live in low-income households in Stamford and are referred through their schools. Typically, Opus and Person-to-Person serve approximately 15 percent of the total number of children who qualify for free or reduced-price meals in Stamford, a primary criterion for consideration. Opus raises money throughout the year for the program, but the majority of the funds come from the annual Balloons for Campers Day event. Held on May 18 this year, it raised more than $60,000 to send close to 600 children to local day camps this summer. Kelly Associates was the lead sponsor for the balloon fundraiser. Businesses interested in becoming corporate sponsors of Opus can contact info@opus4p2p.org. For more information on Opus, visit www.opus4p2p.org.